Original c1862 sixth-plate ambrotype, Confederate officer wearing cavalry boots. Buttons are tinted gold, and it looks like he's wearing a gold ring. Under magnification the buttons appear to be dome shaped on a flat base. Guaranteed to be an ambrotype and not any another format. It is a clear glass. Ambrotype with the back painted black and a mat and cover glass on top. Comes in full case that is 3.75" x 3.25" when closed. Ambrotype is in overall very good condition with a couple of mat abrasions as shown. Overnight to most US locations. Rare unusual history photograph csa gettysburg mosby mosby's rangers va armed general south southern union military photography photograph 1860s soldier picture antique vintage 1800s. 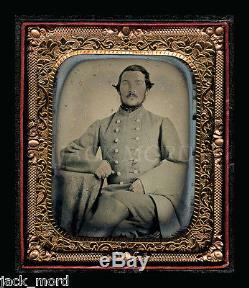 The item "1/6 Ambrotype Photo Confederate Civil War Soldier Virginia Cavalry" is in sale since Tuesday, April 05, 2016. This item is in the category "Collectibles\Photographic Images\Vintage & Antique (Pre-1940)\Ambrotypes". The seller is "jack_mord" and is located in Woodinville, Washington.